This quick tip will show you how to install Phalcon on a Homestead Improved instance, and will help you get a sample Phalcon app up and running. The version of Phalcon weâ€™ll be using in this Quick Tip will be 2.0 – a pre-release. If you read this when Phalcon is already in a mature 2.x stage, let us know and weâ€™ll update the post. To install the stable 1.x version, just run sudo apt-get install php5-phalcon and it should work. Get HI (Homestead Improved) up and running via this quick tip. Zephir is the language that powers the new Phalcon. Instead of being written in C, Phalcon 2 is written in a mediator language called Zephir, designed solely for building PHP extensions. Find out more about it here. If the VM is not up yet, run vagrant up, then enter the VM via vagrant ssh. This installs the extension. You still need to activate it by including it in your php.ini file. Letâ€™s check if it installed correctly. Restart nginx and php5-fpm. Run php -i | grep Phalcon. If you get any output at all (e.g. â€œAuthor => Phalcon Teamâ€�), the installation was a success. 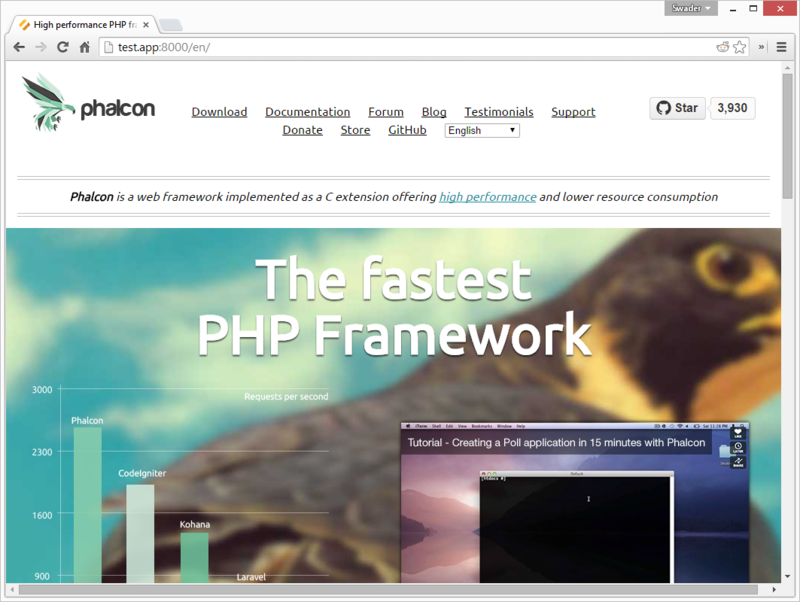 Weâ€™ll use the Phalcon home page as a sample site. Open /app/var/config/config.php and change baseurl to / and debug to 1. BaseURL is misconfigured for an unknown reason, while debug needs to be activated to deactivate the caching component which is currently having problems working properly. This will be fixed in the future, so if youâ€™re reading this any time after August 2014, try it out with the default settings. Save, exit, and restart Nginx with sudo service nginx restart. If you get a 502 error when you run the application after Step 5, thereâ€™s still an outstanding bug with Xdebug thatâ€™s preventing Phalcon 2 from working properly. It being under heavy development means itâ€™ll be resolved shortly, but in the meanwhile, just going into /etc/php5/mods-available/xdebug.ini and commenting out the contents, then restarting with sudo service php5-fpm restartshould solve things for you. Thatâ€™s it. You can now visit the site in your hostâ€™s browser by running http://test.app:8000 (or any other virtual host URL you defined, if you didnâ€™t use test.app like I did above. Feel free to start hacking away and experimenting on Zephir and Phalcon 2.0 code now!